I found something while reading the DAR - Daughters of the American Revolution Genealogy Guidelines, page 93 of my printed copy, the last paragraph of the page, "A designation of patriotic service is given to any person who entered a land claim for a land grant between 1 January 1778 and 26 November 1783 (the date of the law and the latest date accepted by NSDAR for any service). The law states (State Records of North Carolina, vol. 24, p. 44) "That every person . . . before he shall enter a claim for any of the lands aforesaid, shall take and subscribe the Oath or Affirmation of allegiance and Abjuration prescribed by the law of the state." Many of the entries for vacant land in individual counties have been abstracted and published by Albert B. Pruitt, Weynette Parks Haun, and others. For the George Plott's land grant # 484, which has been read incorrectly for years, today I noticed that the survey for the property disclosed, "Entered May 28th, 1779." If I understand correctly, for this particular land entry, George Plott would have agreed to, "the Oath or Affirmation of allegiance and Abjuration prescribed by the law of the state." 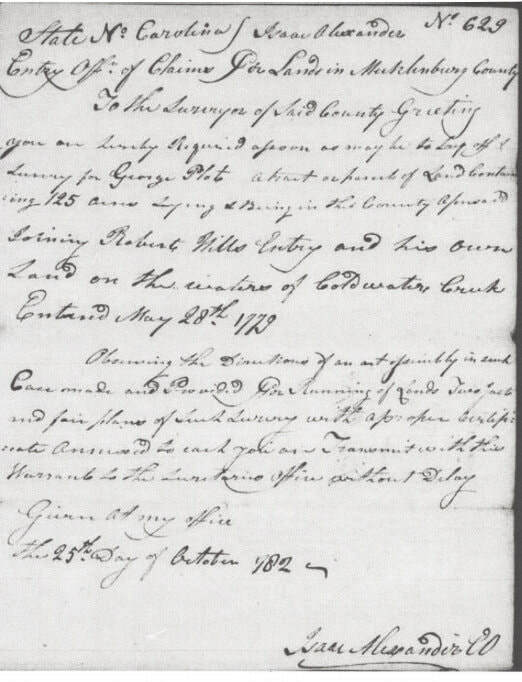 George Plott's name was also listed on a 1778 Petition in Mecklenburg, which I think should also be provided to DAR for review. 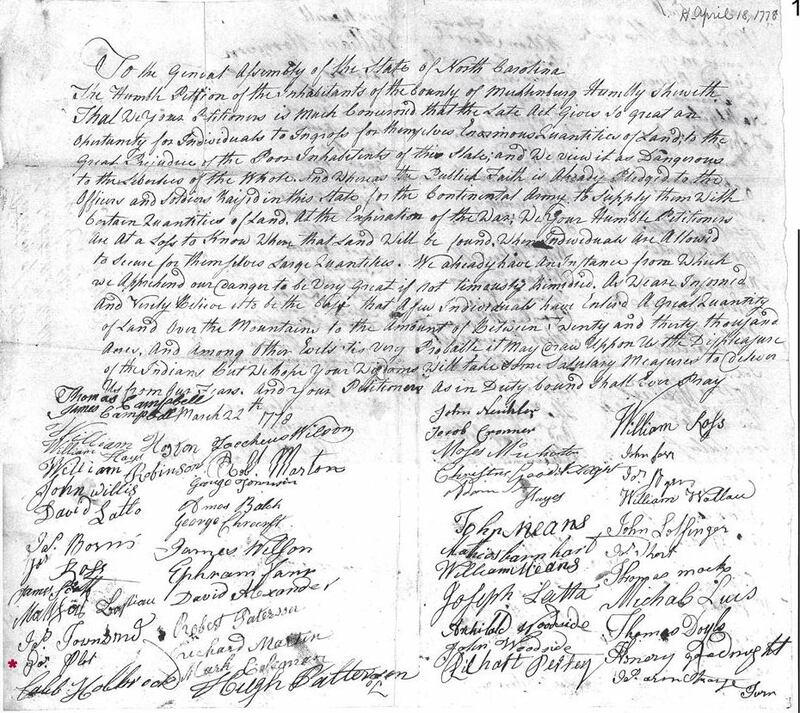 In the Petition the following statement, "And Whereas the Publick Faith is Already Pledged to the Officers and Soldiers Raised in this State for the Continental Army to supply them with Certain Quantities of Land At the Expiration of the War;" needs to be reviewed by DAR to see if they will accept the petition as noted in the DAR Genealogy Guidelines, page 65, the third paragraph, "Signers of Petitions to the new provincial and state governments acknowledged to the new government's right to represent the people. The constent and wording of the petition must demonstrate loyalty to the cause of American independence." My DAR application has been a long story and, although it is at the main DAR office in Washington, DC, it is yet to be approved. Plus, I need to wait for my DAR number to be issued. Plus, I will need to submit a supplemental for this information on George Plott. My DAR number may not be issued for a couple of months yet. "I can't in good conscience ask others to wait" for as long as it is taking my application to be approved and to get a supplemental in on George Plott. Here are two possible documents for George Plott to be a Patriot in the DAR that others can use. I have ordered a copy of the Mecklenburg County Land Entry Log book from the North Carolina Archives and the Albert Bruce Pruitt book, "Abstracts of land entries: Mecklenburg Co., NC 1778-1795" from a local library, inter-library loan. When I recieve those copies, I will post for you. If we can get George Plott in DAR as a Patriot that means that all nine of his children family lines are included. ​Copyright 2016. All rights reserved.